B&G Heating and Air is a proud supplier of Carrier brand commercial and residential HVAC equipment. Willis Carrier is credited with inventing modern air conditioning in 1902. Carrier, along with six other engineers formed the Carrier Engineering Corporation in 1915. By 1920 their first plant was built in Newark, New Jersey. In 1955 Carrier merged with Affiliated Gas Equipment, Inc. and was later acquired by the Untited Technologies Corporation in 1979. As of today Carrier is the largest air conditioner producer in the world. 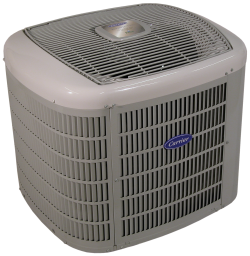 Our company has a full inventory of Carrier commercial and residential AC units and equipment ready for sale and installation. Our certified technicians are well-versed with the Carrier brand air conditioning and heating line, they will install, repair, and maintain your Carrier AC units. In combination with Carrier, B&G Heating and Air is dedicated to providing our commercial and residential customers alike with the best AC units and quality service. Whether it's for a business or a home, we want to ensure you have superior equipment and the proper heating and cooling your establishment or home needs. As a service provider for Carrier, we uphold their standards of quality and values. We are proud to install and repair Carrier HVAC systems because we know it is the among the best in the industry. Together, we strive to ensure your complete sale, installation and maintenance is well taken care of so you can stay cool in the summer and warm in the winter.